James Bond is assigned to hunt down and eliminate Kraken, a radical anti-capitalist who has targeted Britain’s newly-upgraded nuclear arsenal. But all is not as it seems. Hidden forces are plotting to rebuild the faded glory of the once-mighty British Empire, and retake by force what was consigned to history. 007 is a cog in their deadly machine – but is he an agent of change, or an agent of the status quo? Loyalties will be broken, allegiances challenged. But in an ever-changing world, there’s one man you can rely on: Bond. James Bond. Hammerhead collects the six-issue mini-series by Andy Diggle, illustrated by Luca Casalanguida. I think this may well be the first graphic novel I’ve ever reviewed. I’ve read a few, but this is definitely the first Bond. I’m a huge Bond fan, both the books and movies, so it was interesting to see how well it translated to this format. 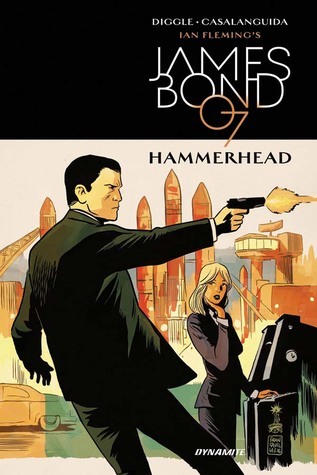 I have to say I was impressed – we’ve got a very authentic-feeling Bond story, plenty of action and nice one-liners thrown in, an implausibily-named villian and some evil shenanigans, with a smattering of globe trotting . The action comes thick and fast from the start and there’s nary a pause for breath as Bond follows the trail of ubervillain Kraken and a cunning plan involving stolen nukes. So far, so Bond. It’s glorious fun spotting where the story is going to go. The villian’s motivations are delightfully sinister, if a bit random – I’m not *entirely* sure that our Kraken really thought things through here, but it’s a minor niggle. Will definitely be looking out for more of these in future. And I’ve realised that I’ve missed the Warren Ellis/Jason Masters Bond books, so I’ll be off to check those out. Many thanks to Dynamite Entertainment and NetGalley for the review copy.